I have been invited to provide work for a small public display during the month of August. The work will be in a 4 foot wide 3-shelf case. I have tentatively worked out the layout, but have found a need to counterbalance the top shelf which will have three pieces: the central is a round work (https://smithartonline.wordpress.com/2017/09/28/round-kitsune-debate/) and, to one side, is a 6X6 piece (https://smithartonline.wordpress.com/2018/01/04/le-reve/). I need another 6X6 on the other side of the round…so much for the artist answering the call of the Muse; this is a totally practical decision. I have kept with the Le Rêve theme mirroring the other 6X6. 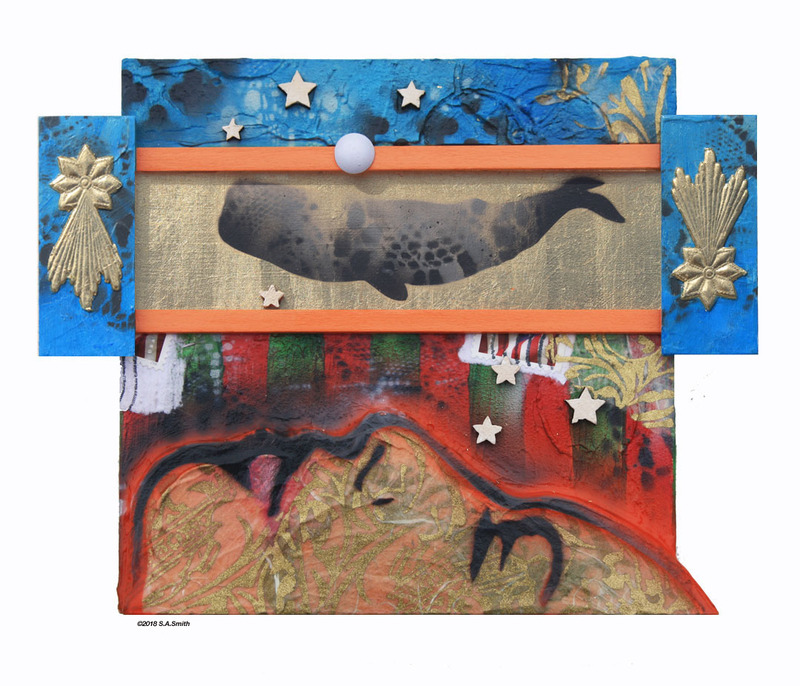 In this work I reference the Genesis creation story: the fifth day (when whales were created). My intent is not to present a religious statement: it is a good story. These types of stories are found around the world. This is simply an accumulation of symbols related to the concept of creation…basic visual elements to create the story as you see fit.